The Lake Charm Region is a hidden Oasis with so much to see and do. It basks itself in environmental beauty and extends itself to the recreational delightswith the townships of Swan Hill and Kerang having so much to offer, with many local eateries, an exciting retail hub and the Mighty Murray River. Description: Permanent open freshwater Wetland. Size and Level: Lake Charm is 520 hectares in size and holds around 22,000 mega litres of fresh water. 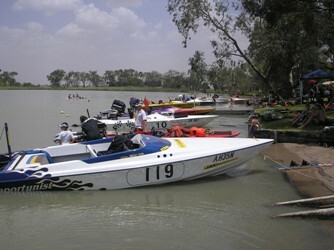 Recreation: Fishing, Water Sports, Relaxing. As a matter of interest Lake Charm is listed as part of the Kerang Wetlands Ramsar Site under the convention on Wetlands. (Ramsar, Iran 1971) which aims to promote and protect wetlands throughout the world. A Bird Watchers paradise: Royal Spoonbill, Black Tailed Native Hen, Coot, Ibis, Sea Eagles, Pelicans, Parrots, the endangered Grey-Crowned Babbler are just a few of the many birds that you will find around the area. Water Ski racing Victoria, to check calender dates click on the image below. Observatory and Planetarium Lake Boga Murray Valley hwy 0350372482 or 0400 123 962. Bookings Essential. Ready Lake Swimming Beach Apex Park. Historical Museum Riverwood Drive Kerang. Along the Murray Valley Hwy look out for the Seasonal road side stone fruit stalls citrus and Veggies. Royal Hotel Kerang 5452 1063.